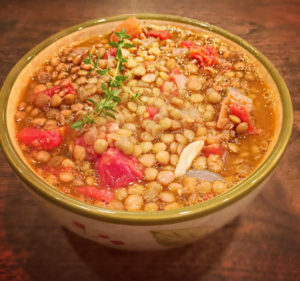 A lentil is a small type of legume (a plant seed) that some considered a super food. They have a high nutritional value that anyone can benefit from by incorporating into their diet. They pack up to 22 grams of protein and 10 grams of fiber in a 1/2 cup serving. They are a major source of protein with those who are following a Vegetarian or Vegan diet. Other food in the legume family you may be more familiar with include chickpeas, cannellini beans, red kidney beans, and peas to name a few. Unlike most of these legumes mentioned, lentils take little prep work. You don’t have to soak your lentils for hours or overnight like you do with most legumes. A quick pre-boil and rinse will work perfectly to prep these little wonders for your recipe. 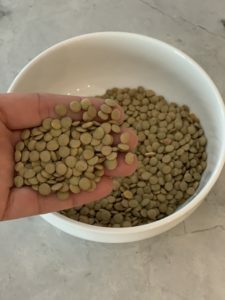 Nutty and earthy in flavor, lentils are very versatile to cook with and are commonly used in soups, dips, and purées. This particular recipe is one that was past down from many Greek generations, we call it Fakia. You’ll find it’s fairly easy to make needing only a few ingredients, and about 35 minutes to complete. 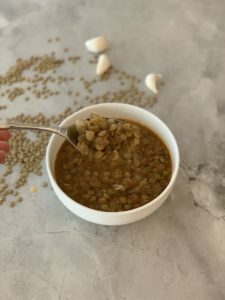 I make this protein packed soup for my family at least once a month during the colder months. Let me know what you think. 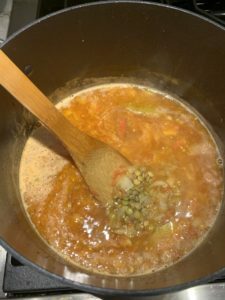 Empty the package of lentils into a large stock pot and pour just enough water to cover the top of the lentils. 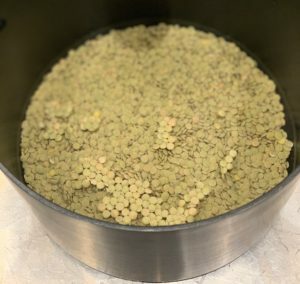 Over high heat, bring the pot of lentils to a boil. As soon as the lentils have come to a full boil, remove the pot from the heat and drain the water into a colander. Rinse the lentils with cool water. Next, place the same empty stock pot over medium heat and add the olive oil. Add the onions and garlic and sauté for about one minute, until translucent. Add the lentils back to the pot and gently stir everything together. Add the tomatoes, water, bay leaves, salt, pepper and gently stir. Cover the pot and let simmer over low heat for 35 minutes, stirring occasionally. You’ll notice that the soup will thicken up the longer it cooks. 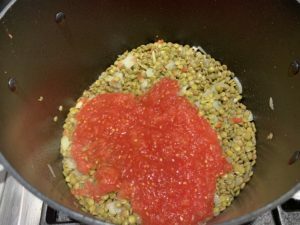 When ready, the lentils should be soft and some may have split, this is all normal. Remove the pot from the heat and If using the vinegar, you can stir it in at this point. My girlfriend is a vegetarian, she is making this for dinner tonight! Thanks for the simple and delicious food you post! Huge fan of Tek! We love you both in Boston!